Sadly we had to say goodbye to Lindt Chocolate's iced sakura drinks and but the new Lindt White Chocolate Strawberry Ice Drink is just as delicious. Try the creamy white chocolate shake with tart strawberries and refreshing lemon whipped cream. Sadly the popular Lindt Sakura Iced White Chocolate Drink had to leave the Japanese Lindt store but its successor will just be as delicious! The new Lindt White Chocolate Strawberry Ice Drink(772 yen) will be available from April 1st to March 31st, 2016. It is made with real strawberries and a hint of refreshing lemon. The refreshing fruity flavor is combined with a rich white chocolate flavor and whipped into a creamy ice cream shake. The drink is topped with lemon flavored whipped cream and strawberry sauce. the dripping pattern around the rim is made of strawberry flavored chocolate, so feel free to eat it once you finished your drink. 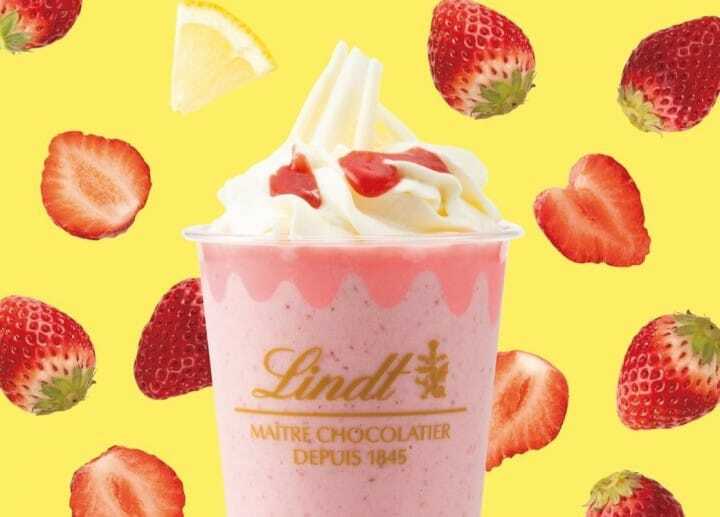 The new Lindt White Chocolate Strawberry Ice Drink is also available as set with two Lindt délice macaroons of choice which will cost 1,080 yen. The recommended délice macaroons for this set are the strawberry and the lemon flavored ones but you can just choose your personal favorites. The White Chocolate Strawberry Ice Drink will is available at all the Lindt Cafes in Japan. The Lindt Cafe in Ginza will have have a special eat-in version for 1388yen.